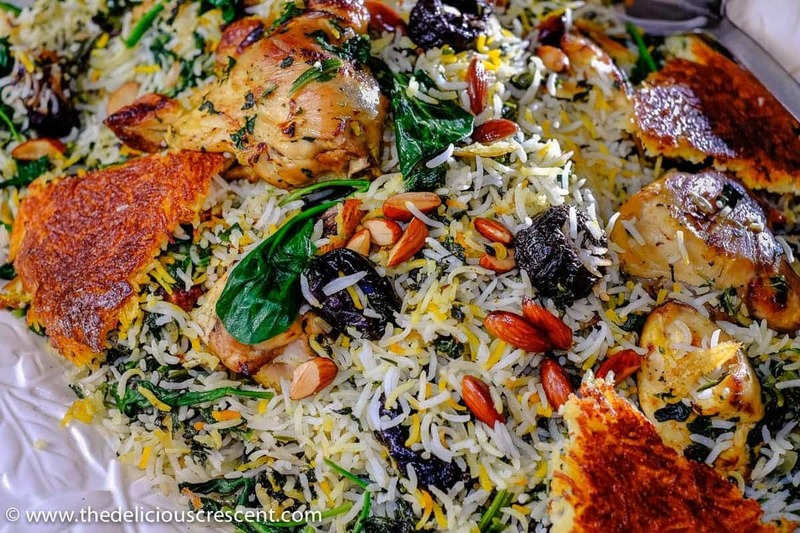 Saffron rice with chicken, yogurt and spinach is a classic Persian rice referred to as Tahchin e Esfanaj. It is a beautiful, delicious and perfectly fluffy rice. Healthy, gluten free and can be prepared in a rice cooker, on stove or in oven. So festive too! Tahchin is a saffron flavored Persian baked rice cake, also known as Iranian rice cake and is mainly prepared with rice, yogurt and saffron. Variations of this recipe are made with lamb, chicken and vegetables. 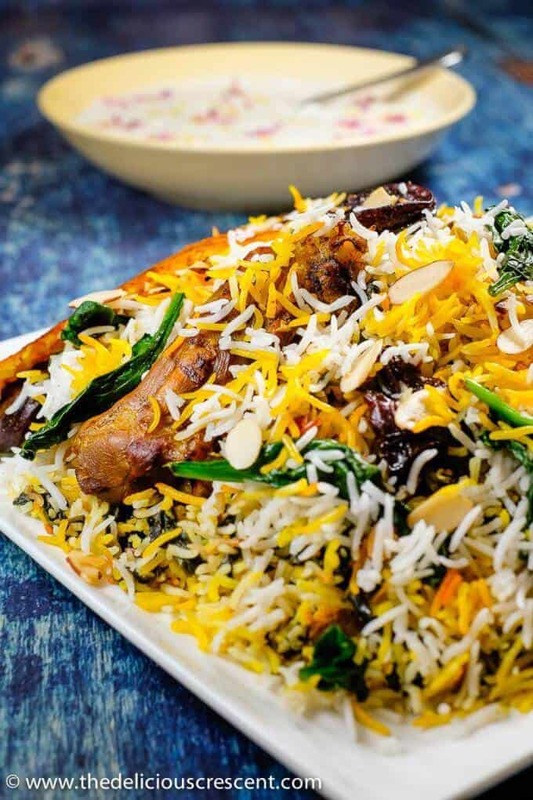 For the recipe here, layers of saffron yogurt rice are placed with marinated chicken, vegetables and steamed together. The characteristic part of this dish is a crispy rice crust known as tahdig, that is formed in the bottom of the dish. One serving of this main course dish provides 225 calories and beautifully combines the five food groups! This saffron rice with chicken uses basmati rice, a flavorful long grain rice variety. Studies have indicated that this rice variety ranges between low to medium glycemic index. And chicken provides good amount of lean protein and alternative to red meat. Spinach is an excellent source of vitamin K, vitamin A (as carotenoids), vitamin C, potassium and folic acid. This leafy green is a source of alpha-lipoic acid, an antioxidant that has been shown to help with blood glucose control. The high amount of potassium is beneficial for maintaining a healthy blood pressure. The chlorophyll present in spinach is known for its anti carcinogenic properties. And vitamin K helps support bone health. The vitamin A and vitamin C contribute to healthy skin and hair. Prunes add some nuggets of sweet flavor and nutrition. They contain phenolic compounds – antioxidants that help prevent free radical damage. And they are a good source of dietary fiber and associated with better glucose control, fullness, bowel regularity, lower blood cholesterol and intestinal protection. Is saffron rice gluten free? Yes, it is absolutely gluten free and can be made vegan, grain free or dairy free as mentioned below. What are the health benefits of saffron? Saffron is supposed to benefit cardiovascular health, alleviate PMS symptoms, possess anti-carcinogenic properties, treat erectile dysfunction, depression and anxiety. As with most foods, the benefits accrue with consistent use. How to use saffron: Store dry saffron in an airtight container away from sunlight, moisture and heat. Use a pinch of salt or sugar and grind the saffron to a fine powder using a mortar and pestle. Soak it in hot water for about 15 minutes and use. You can store this for a few days in the refrigerator. Where to buy saffron: You can buy it online on Amazon or at Persian/Middle Eastern/Indian/Mediterranean grocery stores. Make sure to look for high quality saffron (Persian or Spanish). How to buy saffron: Check the expiration date. Most sellers will guarantee optimal flavor and potency for about 2 years after production date. Dairy free: I have not tried it but you could try using coconut yogurt instead of dairy yogurt. And use olive oil. Vegan: Use tofu and/or chickpeas instead of chicken. Try coconut yogurt instead of dairy yogurt. Choose olive oil and skip egg yolk. Grain free: Use cauliflower rice in place of rice. Check the instructions for making cauliflower rice. Cauliflower will not crisp up like rice to make the tahdig (rice crust), but you may place thin potato slices at the bottom of the dish before steaming it together. 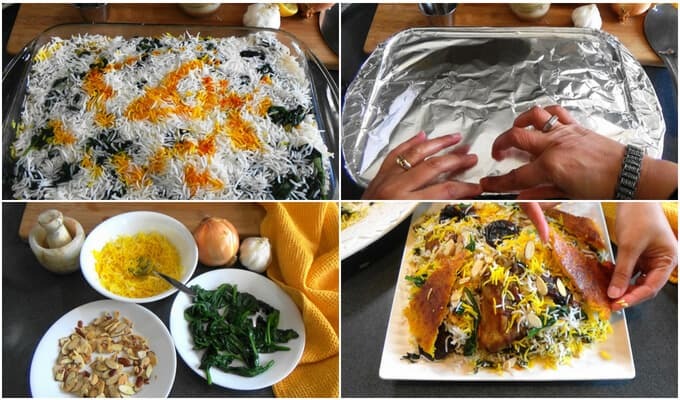 Saffron rice with chicken, yogurt and spinach is a classic Persian dish referred to as Tahchin e Esfanaj. It is healthy, gluten free and can be prepared in a rice cooker, on stove or in oven. Elegant, festive and delicious! Combine chicken, 1/2 sliced onion, 1 grated garlic clove, 1/2 tsp salt, 1/2 tsp black pepper, 1/2 tsp Persian mixed spice, 1/2 tsp turmeric in a cooking pot. Add half cup water and cook over medium heat for about one hour until well done. Alternatively it can be baked for one hour without adding water as the chicken will release its own juices. Drain any juices from the cooked chicken and set aside. 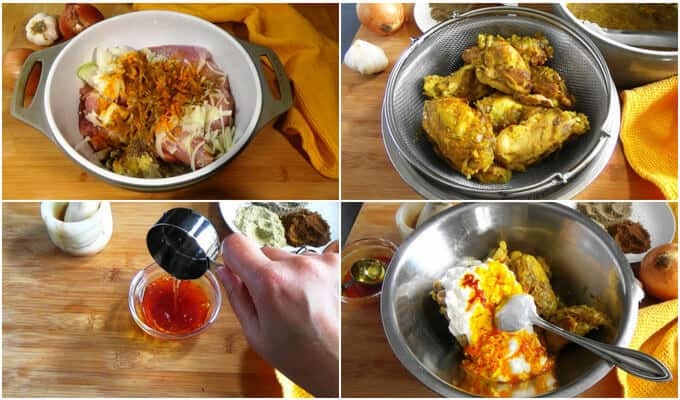 Combine the cooled chicken, yogurt, one tbsp saffron water and preferably marinate overnight. Heat two tbsps of oil in a skillet, sauté remaining sliced onion and grated garlic clove. Add chopped spinach, 1/4 tsp salt and simmer five minutes. Stir and let juices evaporate. There are two ways to proceed. 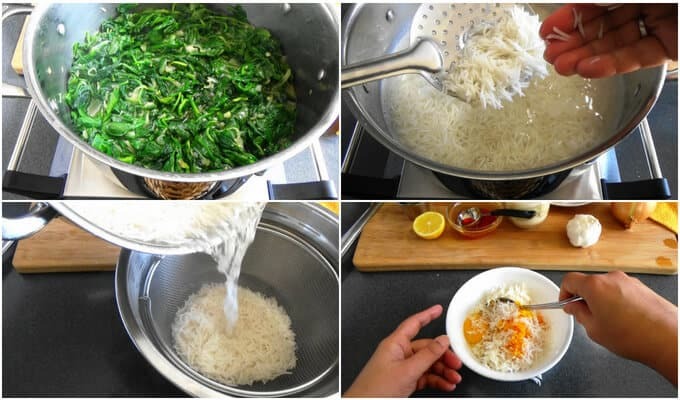 (1) Using the Persian rice cooker (easier method). (2) Or boiling rice first and then baking it in the oven with remaining ingredients (traditional method). Wash the rice thoroughly, until there is no starchy water. It may require 4-5 rinses until the water is clear. Drain the rice well. Bring two and half cups water to a boil in a rice cooker. Add two tablespoons oil and 3/4 tsp salt. Once the water comes to a rolling boil, add the rice. Let it cook just until all the water is absorbed. It is important to not let the rice steam further. Transfer the cooked rice to another container. 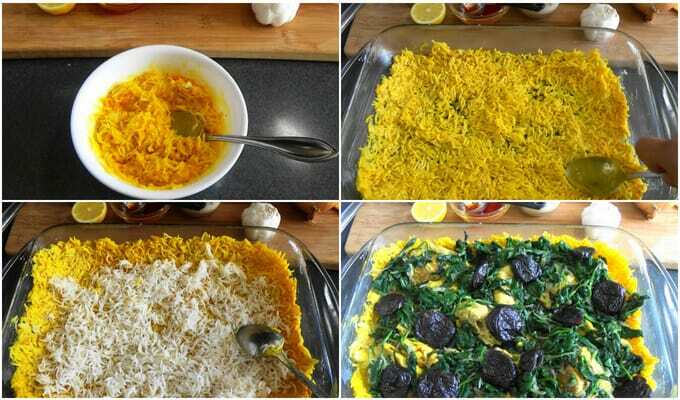 Persian rice is often prepared with a rice crust in the bottom. When the rice is flipped, the crust is on the top. A Persian Rice cooker is specially designed to make the crust. Heat 2 tbsps of butter in Persian rice cooker. Combine 2 to 3 tbsps of chicken marinade, couple scoops of cooked rice, one tbsp saffron water and egg yolk. Spread this mixture evenly over melted butter. 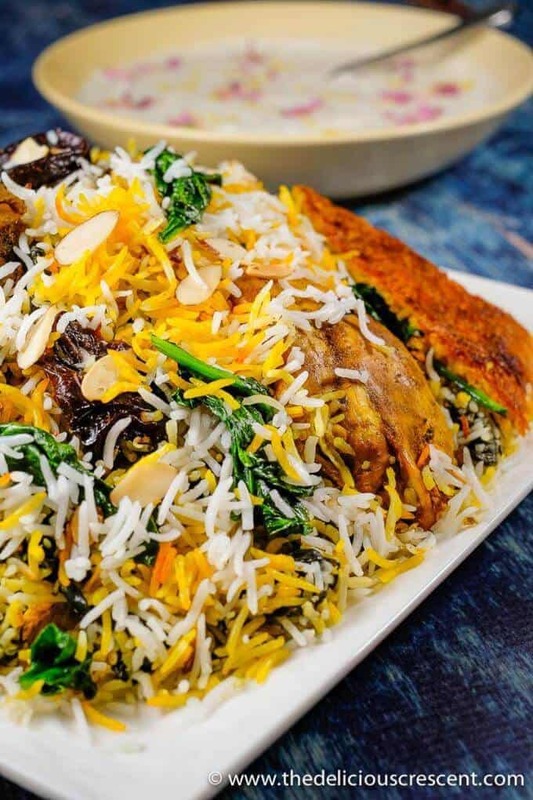 Layer cooked rice, chicken, prunes, spinach and end with a rice layer. 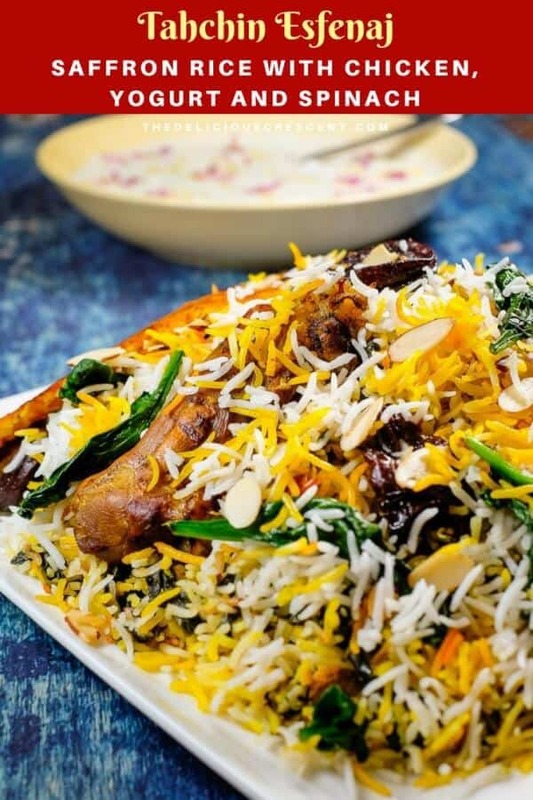 Sprinkle one tbsp saffron water and lemon juice over rice. Place lid and let it steam for 20 minutes as per the rice cooker instructions. Check out the video for the Persian Lentil Cranberry Rice to see how this is done in a Persian rice cooker. Alternatively it can be prepared in the oven. Preheat oven to 350ºF. Boil 7 cups of water with 1½ tbsp salt in a large cooking pot. Add rice and boil at medium high to high heat for 5 to 6 minutes until rice grains are soft. Stir the rice while it is cooking. Drain rice in a colander and set aside. To make the rice crust, melt 2 tbsps of butter in oven proof dish such as Pyrex baking dish. Combine 2 to 3 tbsps of chicken marinade, couple scoops of cooked rice, one tbsp saffron water and egg yolk. Spread the mixture evenly over melted butter. 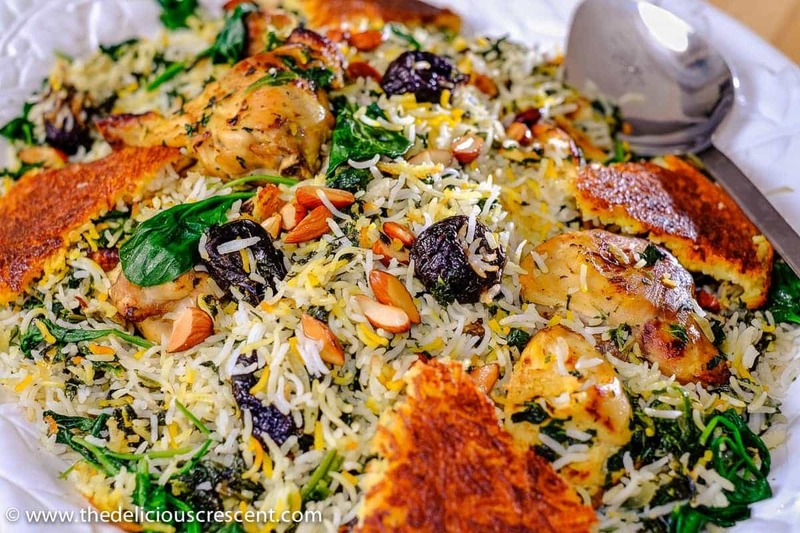 Layer cooked rice, chicken, prunes, spinach and end with a rice layer. Sprinkle one tbsp saffron water and lemon juice over rice. Pour two tbsps oil evenly over rice. Cover with a sheet of aluminum foil and seal well. Bake for an hour or more until a golden crust is formed in the bottom. Transfer the dish onto a wooden surface or place over a moist towel for couple minutes. Using a spatula gently loosen the edges as you would do for a cake. Place a serving plate over the dish and flip it over as you would do for an upside down cake. Carefully loosen the rice and arrange it. If you prefer, the crust may be separated, cut and placed around the rice. Garnish with sautéed fresh spinach (see note 7) and roasted sliced almonds. You may serve it with a Persian yogurt dip with shallots. The amount of water used for cooking rice is very important for final texture of the dish. And it differs with age of the rice. Basmati rice typically will need less water than other long grain rice varieties. I use trial and error to determine the right amount of water needed for cooking. It may range from 1¼ to 1¾ cups water per cup of rice. The amount of moisture in the various ingredients is important for the final texture. In the first step, rice should be cooked to yield well done fluffy rice, holds its shape well but is not too wet and delicate. The spinach should be well drained. The chicken should be lightly coated with the marinade. If the marinade is excessive it can result in the rice becoming soggy. Adjust added fat or salt as needed. Tip for garnish: Heat one tsp of oil and sauté 1/4th pound of fresh spinach lightly, and do not overcook. Make sure to retain the color and shape of spinach and let the juices evaporate quickly. Spread it over a plate and set aside or garnish. You can also prepare this recipe on the stove using a non stick cooking pot. Persian spice mix (advieh) recipe is on the blog or available on Amazon or Persian grocery stores. 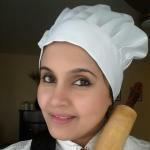 A middle eastern or Mediterranean mixed spice blend could be a substitute. For more tips and serving suggestions check out the blog post above. THIS IS ABSOLUTELY GORGEOUS! I CAN’T WAIT TO MAKE IT. This looks amazing! I have been eating a lot more yogurt with savory dishes lately. I would love to make this with the chicken on the side, so my vegetarian daughter can eat it too. Pinning! We use yogurt in a lot of savory recipes. You can also make it vegetarian by using tofu and/or chickpeas in place of chicken. But making it with chicken on the side sounds wonderful.